For today’s poker players, Texas hold ’em is the game. Every day, tens of thousands of small stakes hold ’em games are played all over the world in homes, card rooms, and on the Internet. These games can be very profitable — if you play well. But most people don’t play well and end up leaving their money on the table. Small Stakes Hold ’em: Winning Big with Expert Play explains everything you need to be a big winner. Unlike many other books about small stakes games, it teaches the aggressive and attacking style used by all professional players. However, it does not simply tell you to play aggressively; it shows you exactly how to make expert decisions through numerous clear and detailed examples. Small Stakes Hold ’em teaches you to think like a professional player. Topics include implied odds, pot equity, speculative hands, position, the importance of being suited, hand categories, counting outs, evaluating the flop, large pots versus small pots, protecting your hand, betting for value on the river, and playing overcards. 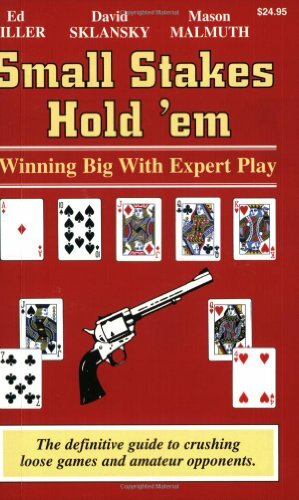 In addition, after you learn the winning concepts, test your skills with over fifty hand quizzes that present you with common and critical hold ’em decisions. Choose your action, then compare it to the authors’ play and reasoning. This text presents cutting-edge ideas in straightforward language. It is the most thorough and accurate discussion of small stakes hold ’em available. Your opponents will read this book; make sure you do, too!